Thank you for joining me as we count down to the MFT release. We are just one day away from the big day! All the new Stamps, Die-namics, and Stencils will be available on Tuesday, December 6 at 10:00 pm EST. Be sure to check out the MFT Blog to see all the new items being revealed today. Don't forget to leave a comment on the MFT Blog countdown posts, YOU could win one of the five $75.00 gift vouchers. I have a bright and cherry card to share with you today. 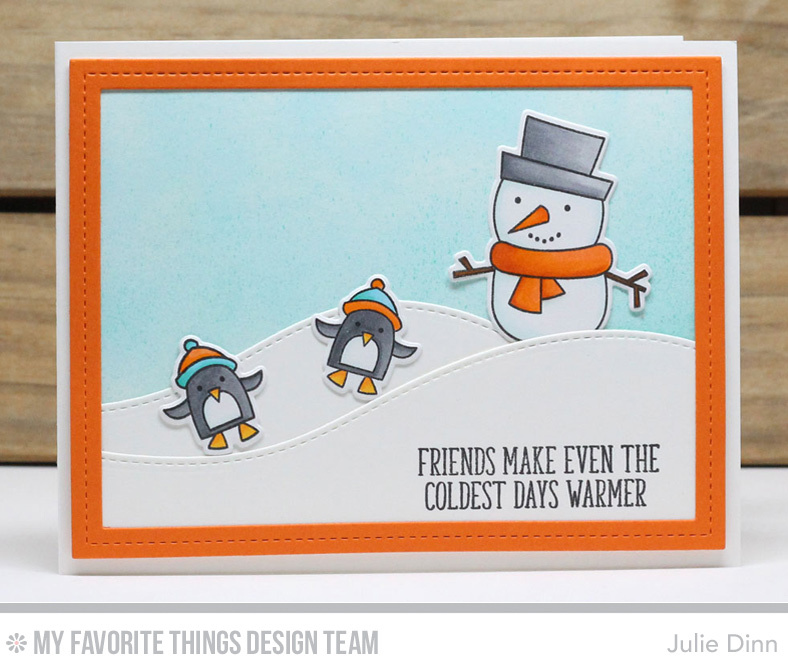 It features the new Cooler with You stamp set & Die-namics, and the Hit the Slopes Die-namics. This is such a fun set to play with! I stamped all the images with Black Licorice Ink on X-Press It card stock and I coloured them with Copics. The bright Orange Zest Single Stitch Frame brought the whole card together. You can just see all the fun these friends are having! Great job! Love your colors and scene. Very adorable! That card is so cute and the orange color really grabbed me.